Have you been following the Hometalk Thrift Benefit For Sheltered Animals Blog Tour??? Today is my lucky day to be a part of this fabulous blog tour. 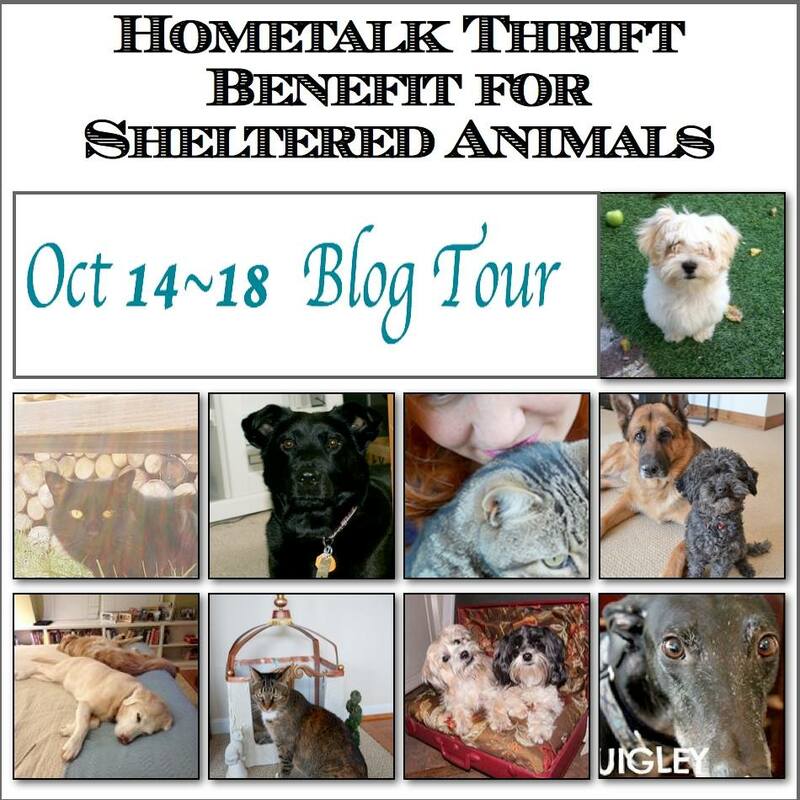 The Hometalk Thrift Benefit for Sheltered Animals Blog Tour started Monday, October 14 and goes through Friday the 18. Here’s a chance to meet new bloggers and many of their animal family members, get creative ideas from thrift shop finds, or read about the wonderful animals that share our journey. I am happy to be a part of this project. And also to share my dog ownership story and the FULL Blog Tour excitement. I have a lot to share today, so let’s get started!! Years ago we went to visit Hubby’s cousin. They had the most beautiful dog. I had never seen an Airdale Terrier before. She was SO sweet. I feel in love with this breed. 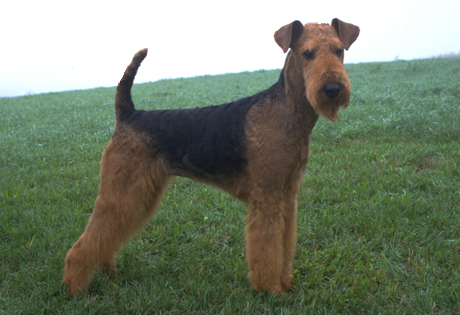 The Airedale has a sweet disposition, but when challenged, is not afraid to stand up for himself. Obedience training is important for these quick learners, but make sure to keep it interesting – they can get bored easily! They also thrive with daily exercise. Cinnamon won my heart the first time I laid eyes on her. She was 4 yrs old and our friends had 3 Airdales. They saw how much I loved Cinnamon and offered to let us have her!! She was the SWEETEST dog. She loved our younger kids, just like Lacy loved the older kids. Taking her for walks and playing with her was a really treasured time. We had other dogs as well. We took our kids to animals shelters to choose THE dog for them. We had Dude, Edipus Rex, Tex, Maggy and Betsy. Sweet, loving and great family dogs!! Did you know that this month is Happy Adopt a Shelter Dog Month?? How fun would it be to grab the kiddos and go “dog hunting” at your local shelter?? Our family dogs are still talked about with fondness and heart felt love. If my community had a thrift store that donated to an animal shelter, I would be sure to shop there. Yahoo!! I know! What a deal and a steal, right? Well, I have been working on these for the past few weeks. I am still not done, but I wanted to share a little bit of my progress so far. Here are my thrifted chairs today. I decided to paint the main color Ancient Gray from Ace Hardware. 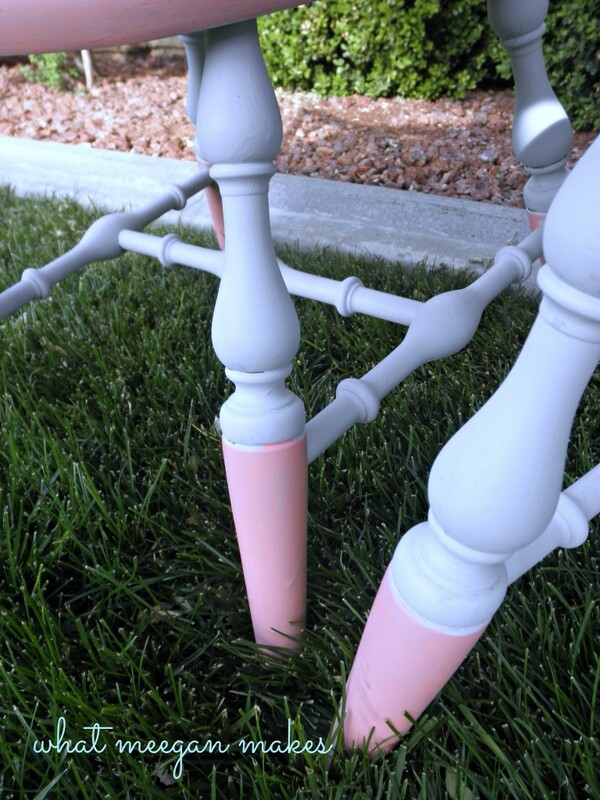 The accent color is from Valspar and called Antique Coral. I am showing you the opposite of each chair so you can see how the front and back look. 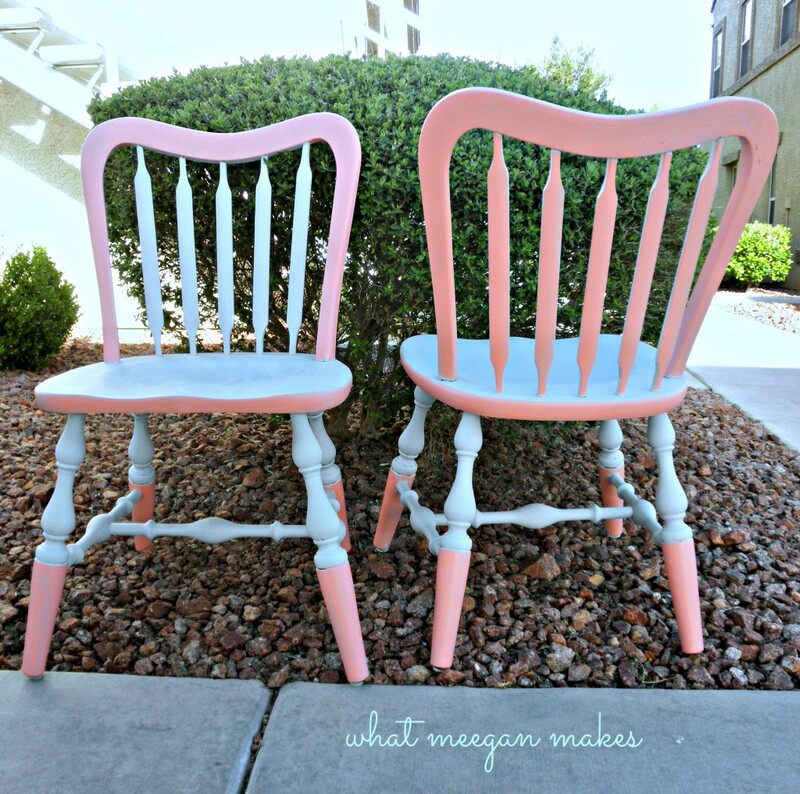 I liked the look of dipped furniture legs, don’t you? The coral blends so well with the gray. Again the front and back. Each chair is painted exactly the same. I painted the seat base gray and the rim of the chair with coral for more detail. 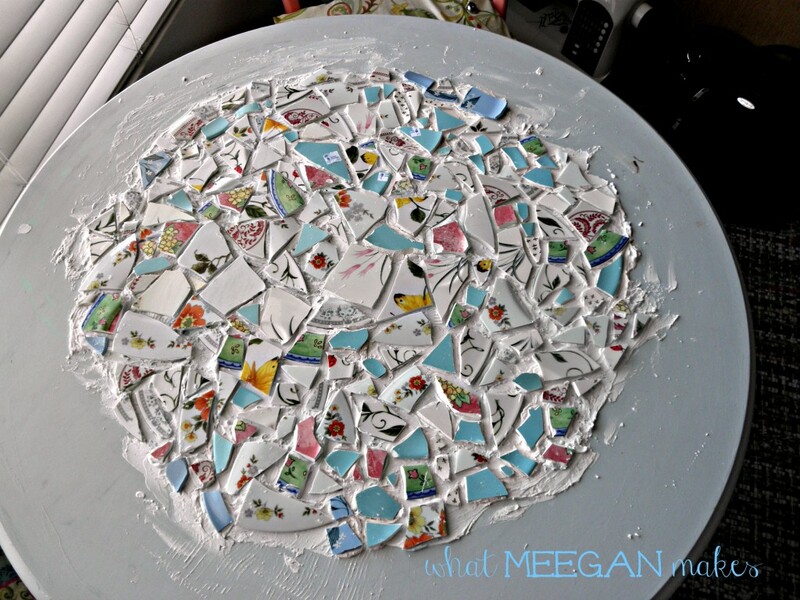 After painting the table Antique Gray, I broke some thrifted plates I decided to make a mosaic top for our table. This is still in the beginning stages. And I have never done this before. But, it is coming along quite nice. Hubby did tile for years and is going to show me how to grout and finish the edges. I am so excited! More pictures to come later, but soon.. Thanks for joining me today. Be sure to follow the Hometalk Thrift Benefit Blog Tour For Sheltered Animals. It is not to be missed. Wow – you’ve been busy- love the unique color palette! and can’t wait to see the finished table- Cinnamon is just precious! 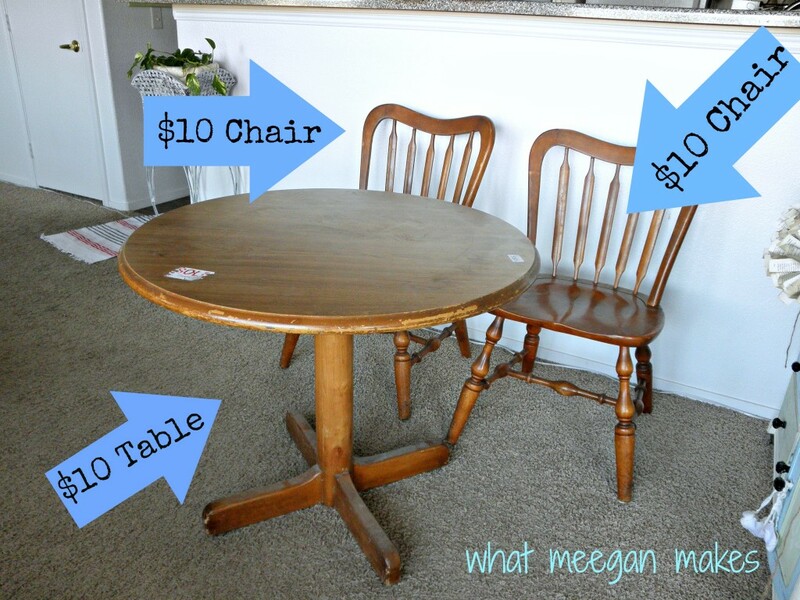 I love your thrift projects! 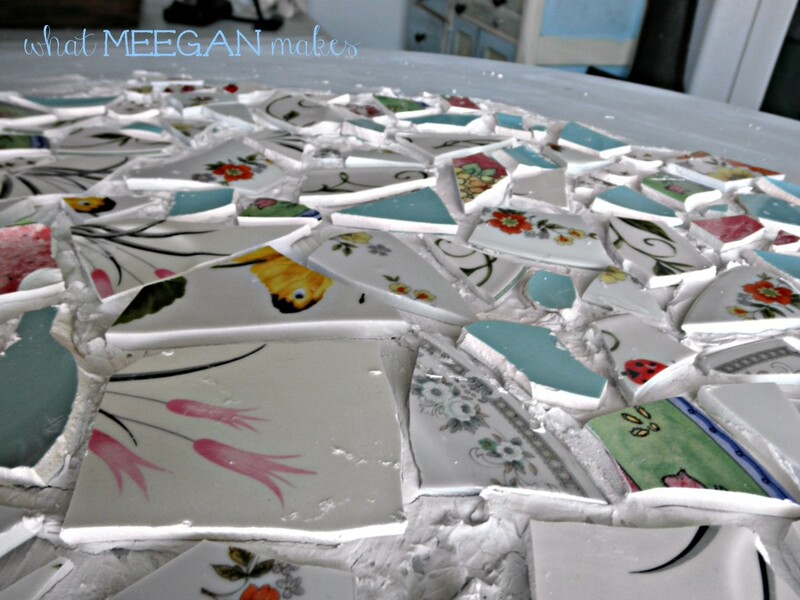 Your mosaic table is going to be gorgeous when it’s done! This blog tour is REALLY fun!! Eak! Meegan I love it! Those chairs are amazing and I can’t wait to see the table. Give the tips for grouting when you finish. Cinnamon is stunning. Airdale Terrier are amazing dogs. Thank you so much for joining the Blog Tour! Thanks so much Jeannette. She really was so sweet. I will definitely be posting about the grout process :) Thanks for pulling together this fabulous tour!! Thank you, Amy! Airdales are large in stature but as sweet and devoted as can be. Thanks for your nice compliments on my table. Thanks for sharing your part on the blog tour as well. I think it is wonderful! What a beautiful dog! 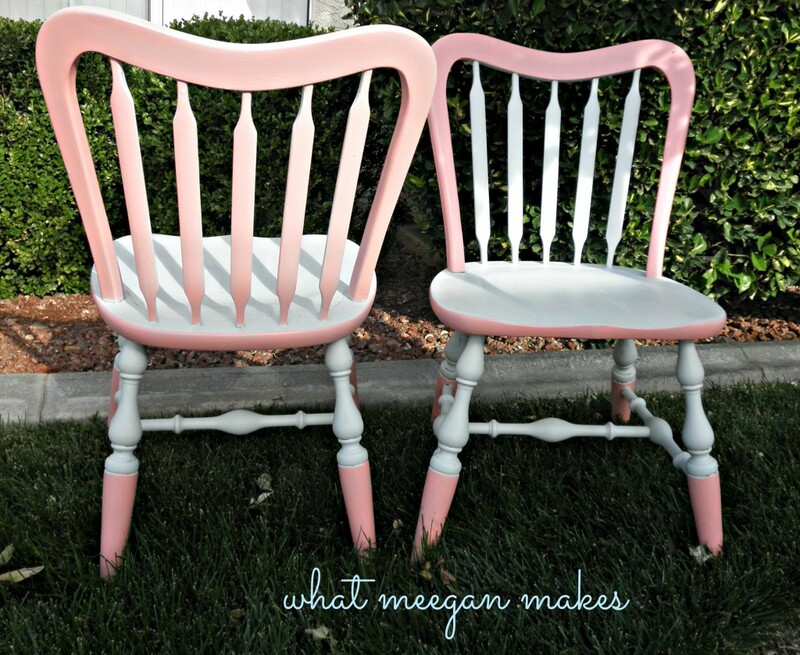 And that table & chair set is darling & will be so great when u r done. Can’t wait to see! Good Morning! First, I don’t know whether to congratulate you or me! Your blog is so captivating, I can’t wait to look the moment I get up to see what’s new! Second, this is the first blog I’ve followed! Wow, you are so talented and I feel like you’re my next door neighbor. I, too, foster and adopt shelter dogs and a piece of my heart goes with every one. I currently have a weenie dog mix, a Yorkie mix and a gentle Tabby cat that loves them both as much as they love him! I also love thrifting great finds. Lets my creativity come thru, keeps me busy and they make wonderful gifts! Keep doing whatever it takes to do this blog thing because you are wonderful at it!